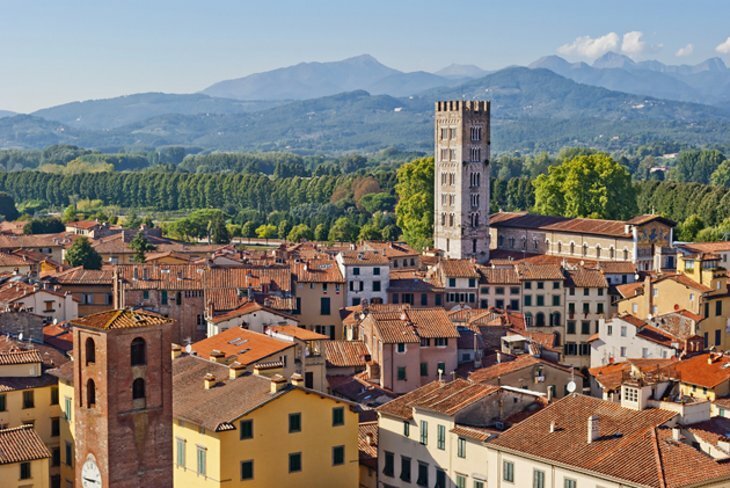 So…you are staying in Lucca, have arrived in the city by train, or you have parked at the train station. Would you like to enjoy a unique break just outside the city walls-perhaps some exceptional pastries and fabulous coffee? 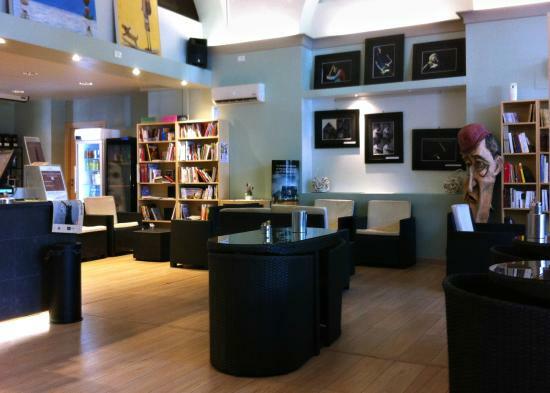 I recommend the perfect place: The LuccaLibri Coffee house and Bookshop. 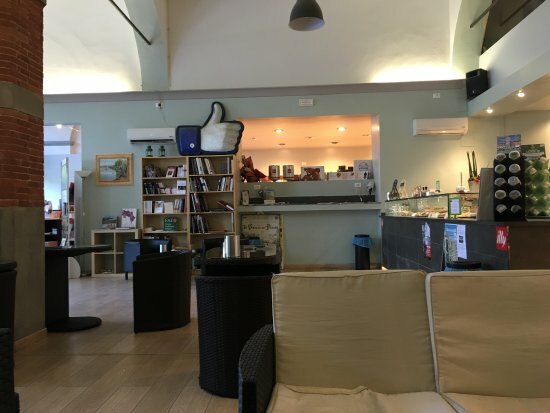 Located less than a two minute walk from the train station piazza in Lucca (Piazzale Bettino Ricasoli) and only five minutes from the southern-most city gate of Lucca, Porta San Pietro, this place offers it all: great coffee, exceptional baked goods and a clean, safe environment in which to relax. Wanda Martinelli, a dear friend and guide, introduced me to this special place in the spring of 2015. Every time since, when I visit Lucca with our small group tours or on my own, I stop in for a welcomed break. I have worked with Wanda for over fifteen years and she is, without question, the best guide in the area! Next time you are in Lucca, regardless of circumstance, please give this wonderful place your business. You will not be disappointed! 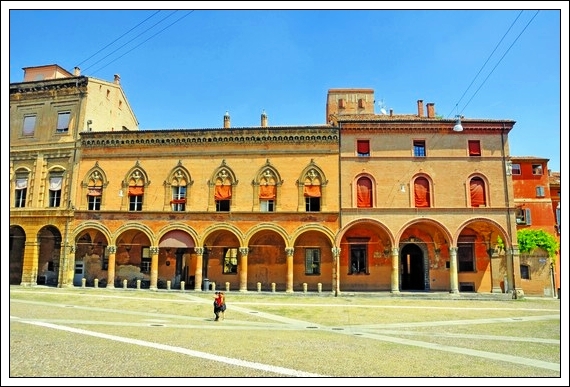 From the train station, walk across the graveled piazza in front of the station. Turn LEFT on the sidewalk along the main ‘ring road’. LuccaLibri is on your left about 100 meters from the station piazza. 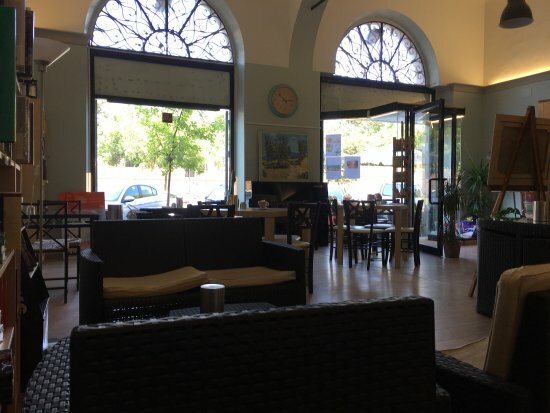 If you park at the train station in Lucca, exit the parking area toward, and across, the piazza, and you will find LuccaLibri on your left about 100 meters from the station piazza. If you are inside the city walls, you can exit the Porta San Pietro, walk to your left to the pedestrian walkway at the traffic light and cross the main road. Turn LEFT and walk about 200 meters to LuccaLibri. Some friends recently invited me to join them on a visit to the Villa Medici in Poggio a Caiano, about fifteen miles west of Florence. What an incredible surprise. This makes for an easy day excursion from Florence city center, by train, to an historic palazzo and beautiful small village in Tuscany. Read on. This gorgeous Renaissance palazzo contains some of the finest art commissioned by the Medici family; from the time of Cosimo the Elder to Lorenzo de Medici (Il Magnifico) to the Grand Dukes. An additional ‘treat’ is that admission is FREE. It was in 1420 that Palla Strozzi began acquiring land and buildings from the Cancellieri, the office of the administration, in Florence. It is at this time we find the name Poggio a Caiano mentioned for the first time in a few historical documents next to the names of Bonistallo and Caiano. In 1488 another famous Florentine family began to show an interest in the area when Giovanni Rucellai purchased the possessions, buildings and houses of Poggio a Caiano. The history of the city, however, has remained tied to another, even more illustrious and celebrated family, that of the Medici. By 1431 Cosimo dè Medici had bought six farms in the region. His grandson Lorenzo the Magnificent purchased more property in the area including all of the surrounding estates, began to build the Villa, initiated a complex project to contain flood waters by means of canals and stabilization of the banks of the Ombrone River and upgrading farming techniques on the estates north of the river. In 1477, work began in earnest on what was to become the farm of Poggio a Caiano – Tavola. 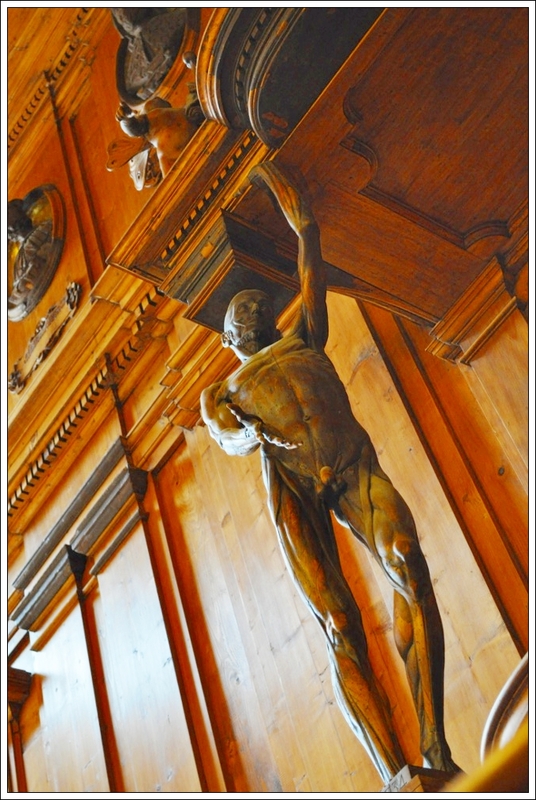 Many highly skilled craftsmen moved to Poggio a Caiano, including masons, carpenters, furniture makers and artists. This colony of skilled labor constituted the nucleus of the town that was born as a “factory” for the Villa. Franciabigio, Return of Cicerone from Exile (1519-1521) with later additions by Alori (1578 – 1582). Over time, Lorenzo and one of his sons who became Pope Leo X, commissioned artists as famous as Alori and Pontromo to create frescoes for the great rooms, especially the ballroom, of the villa. The main ballroom, also referred to as the Room of Leo X, is a startling and unforgettable surprise. Poggio’s location, between Florence and Pistoia, and the presence of the Villa Medici (which remained after the end of the Medici dynasty the summer home of first the Hapsburg-Lorraine and then of the House of Savoia-Italy’s first King used this palace as a country home after the unification of Italy) helped to maintain the prosperity of the small town. Menerous rooms in many Medicean villas were filled with Still Life paintings; in Italian, Natura Morta. The Medici family was very passionate about cataloging the numerous varieties of vegetables and fruits grown in Tuscany. These innumerable paintings have been collected in to one museum at the Villa Poggio a Caiano. You should absolutely be sure to reserve in advance your entrance time for this unique collection of art. A dear friend, Carla Geri Camporesi and her co writer Barbara Golini, who used to live near Florence in Impruneta, wrote a cookbook featuring many of these paintings along with recipes of the time. Even though written in Italian, the quality of the photographs alone are worth adding this volume to your collection. There is no charge to visit the collection of still life paintings, yet you must reserve with the villa directly to enter. Please see details below. During the retreat of the German army in August of 1944, the city of Poggio a Caiano was heavily damaged by artillery fire. Many lives were lost in the town. The villa became a refuge to villagers who hoped for protection inside the estate’s walls. Manetti’s famous iron bridge, one of the best examples of an early 19th Century suspension bridge with cables made of iron, was destroyed by the German Army. Only the two large stone entrance towers for the bridge remain. After the war, Poggio became one of the principal centers for the art of straw weaving (braids, hats, etc. ), or paglia: many of you may remember the straw braided Chianti bottles of years ago. Post-war development was culminated by the separation of Poggio a Caiano from the nearby city of Carmignano. The comune of Poggio a Caiano became its own separate city on July 14, 1962. Camignano, a mostly agricultural community challenged by a textile economy, suffered from the general crisis felt throughout agriculture in Italy in the last part of the 20th century. Poggio a Caiano, however, with its fortunate location between Prato, Pistoia and Florence increased its development in industry and handcrafts, eventually becoming part of the wool and textile industry centered in Prato. Located about 20 minutes outside of Florence by train. Trains to Signa depart regularly (generally at :16 and :53 past the hour) from the Santa Maria Novella station in Florence. The trip takes about eighteen minutes. Train fare, each way, is Euro 2.60 per person. Taxi fare from the Signa train station to Poggio a Caiano averages Euro 18 per taxi. This is the easiest way to enjoy a day excursion from Florence without the hassle of driving, parking and possible fines! Fabulous food, great service, warm atmosphere, fair prices and a very good wine list! Closed on the 2nd and 3rd Monday of each month, New Year’s Day, May 1st and Christmas Day. CONTACT US! If you are interested in any of our small group explorations of Italy, please send an email to private_italy@hotmail.com. One of our staff will reply to your inquiry as quickly as possible. We hope to share “our” bella Italia with you! Thank you for reading and following our travel blog. Yes, it is a tongue twister, this gorgeous palazzo in the center of Bologna – Palazzo dell’Archiginnasio (Arkey-je-nah’-see-oh). This was once the main building of the University of Bologna, Italy’s oldest university. With the Cathedral of San Petronio, once a church well on its way to outsize St. Peter’s Basilica in Rome, the Fountain of Neptune and the food of Bologna to temp you, why visit? Read on. The University was founded in 1088. It was not until 1563, when Pope Pius IV commissioned the construction of the Palazzo, that all university classes were consolidated. Until then. classes were housed in various locations across the city. The facade of the Palazzo provides only a hint at the beauty within. What draws many visitors to this fascinating and historic structure is the Anatomical Theater located on the second level of the palazzo. 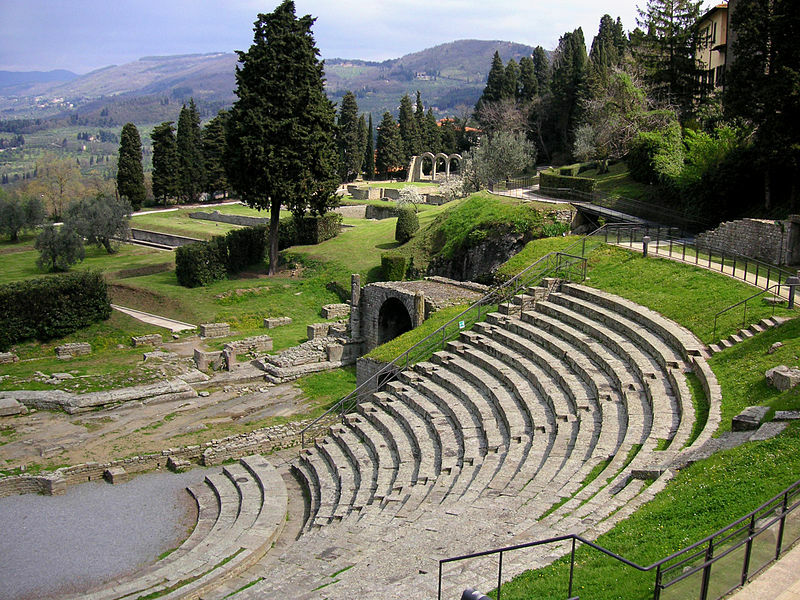 In 1637, Antonio Levanti was given the commission to build the theater, first of its kind in Italy. Constructed in both cedar and cypress wood, the theater was used for the first student human dissections permitted in Italy. The “Doctor” as the professor was called, sat on a special seat above the operating area. A large baldaquin rose above him, upheld by carved figures of men with no skin on their bodies – called ‘gli spellati’ in Italian – created by Ercole Lelli. As morose as it may sound, the figures are beautifully carved, as are the busts and other figures in the theater. Curiosity follows curiosity in this historic room. Statues of the most prominent physicians of Greece and Rome, Hippocrates and Galen, grace the front corners of the room. Directly across from the Doctors seat, above the theater seats, is a small door (often unnoticed by visitors). It was during the twenty-four hour dissections that members of the Dominican Inquisition would open the panel, observe and judge whether or not the teachings were heretical. Under the watchful gaze of those judging eyes, the Doctor’s three meter pointer would be used to instruct the students in various important details about anatomy. If any of the teachings were judged inappropriate, the Doctor would have to pause instruction, then debate and defend his position. Travelers have wondered why cedar and cypress were used to construct the theater. One only need imagine twenty four hour dissections, conducted with no break (and no opportunity to leave the room), to imagine why fragrant and odor absorptive woods were used. In 1838, the gorgeous open rooms that once housed the University library became the home of the Communal Library for the city of Bologna. See IF YOU GO below for details about visiting the library. This is certainly a unique and unusual corner of Bologna. 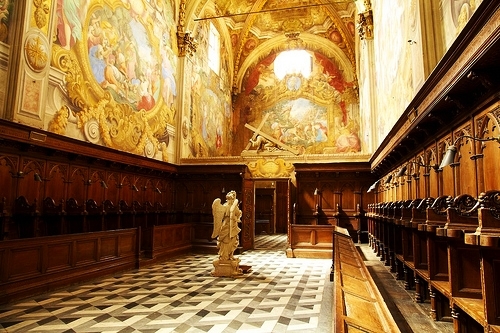 So, when you visit the city and have completed your time at the Duomo and the food market areas of the city, I highly recommend a visit to both the library of Bologna as well as the Teatro Anatomico in the Palazzo dell’Archiginassio. Both the Palace (including the library) and the Teatro Anatomico are open Monday through Friday from 09:00AM to 18:45 (6:45PM). On Saturday, hours are 09:00AM to 13:45 (1:45PM). On Sundays and Holy/Festival days the building is closed to the public. NOTE: From 1 to 24 August, the building is open only between the hours of 09:00AM and 14:00 (2:00PM) Monday through Saturday. Sundays and Holy Days/Festivals the building is closed. Over 38,000 manuscripts and incunabula, along with other objects, are now housed in the library. It is open to the public. However, you must leave your backpacks and books behind in a secure area when you register at the front desk. The only exception to allowing computers and other items in the library is if you present a letter of research from a college or university. 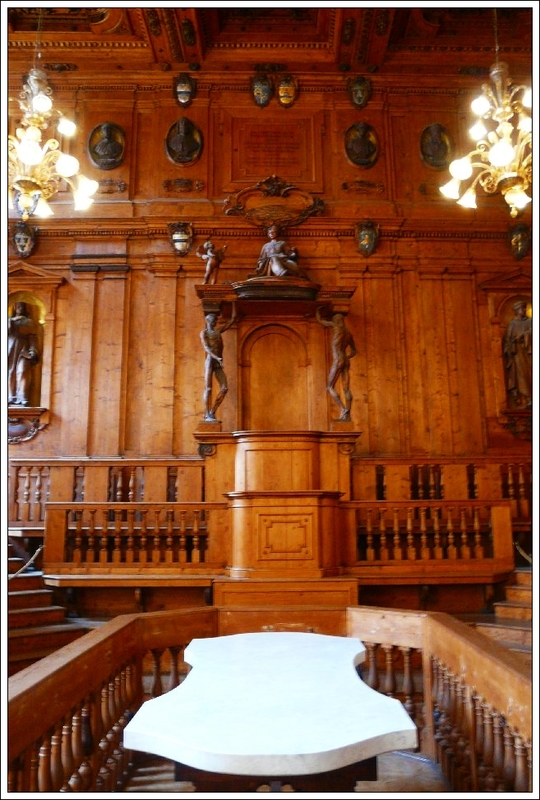 The Anatomical Theater can be visited at any time during the palazzo’s open hours. 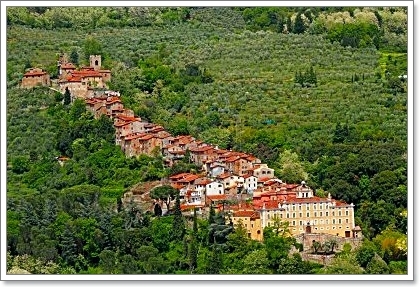 Few tourists know of the road that connects Lucca with the small village of Calci. Nor do many visitors know of the monumental surprise that awaits them – the Charterhouse of Pisa. My recommendation is to not take the A-11 autostrada from Lucca to Pisa. Rather, as you arrive at the Lucca Ovest (West) interchange follow signs to the SS-12 (Strada Statale-State Road) toward San Giuliano Terme. As you drive toward San Giuliano Terme, you will pass through the village of Santa Maria del Giudici then enter a tunnel. After you leave the tunnel and drive into San Giuliano Terme, watch for a turn to the left ttoward the town of Calci. Once you are on the road to Calci, the signs directing you to the Certosa (Charterhouse) of Pisa make the rest of the trip very easy. This is an enormous complex of buildings, many of them restored after World War II. The remote and beautiful setting, once referred to as the “Valle Graziosa” or “Pretty Valley,” allows visitors the opportunity to enjoy a visit to a beautiful church without the crowds that are found below in the city of Pisa proper. Though the charterhouse is located only about six miles from Pisa, you may as well be a hundred miles from such a large population center. Gorgona, a small island located about twenty miles off the port of Livorno, is part of the Tuscan Archipelago. (On very clear days,you can see the island from a few of the small seaside villages north of Livorno – Tirrenia and Marina di Pisa). In 1369, Pope Gregory XI expelled a group of Benedictine monks from the island. Some of the monks from Calci were sent to repopulate the island, even as their population grew at the Charterhouse. In the mid-15th Century, due to threats of possible attack by Saracens, the monks on the island brought all of their valuable documents to the Charterhouse. The current architectural style of the buildings is owed to Baroque work of the 17th and 18th Centuries. 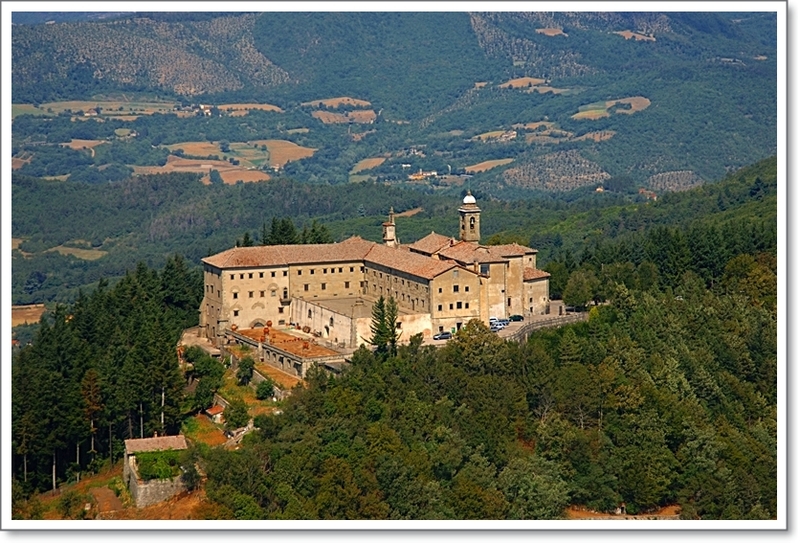 After Napoleon’s suppression of religious orders, in 1808, the Carthusian order at Calci was forced to disband. 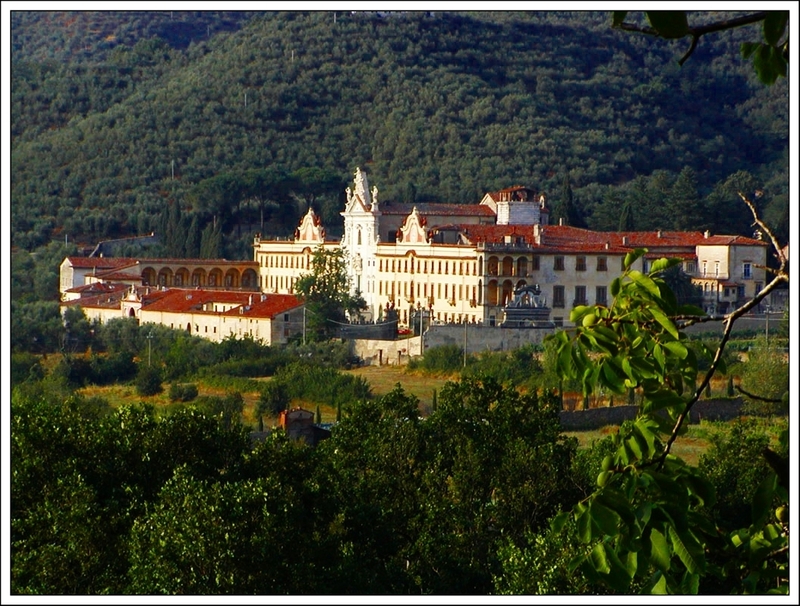 The majority of the monks moved to the Vallombrosian Monastery in Pisa. Most of the silver and gold pieces collected from the religious community were sent to Florence to be melted and used for other purposes. Contents of the library, records, archives and many valuable paintings were sold. In 1814 when the Grand Dukes of Lorraine permitted the return of the order the Charterhouse, their financial support assisted in the purchase of items that had previously been sold. A few years after the unification of Italy, in 1866, the government decreed that all works of art, the library and other important documents were to be removed. The buildings and land, then, were assigned to the new Ministry of Education. From 1946 until 1963, a group of Carthusian monks from the Netherlands attempted to establish a group of monks at the Charterhouse, with the hope of reestablishing their order in their home country. Their efforts yielded no success. When the last of the two Carthusian monks were moved from the monastery in 1972, the state took over responsibility for the maintenance and care of the buildings. 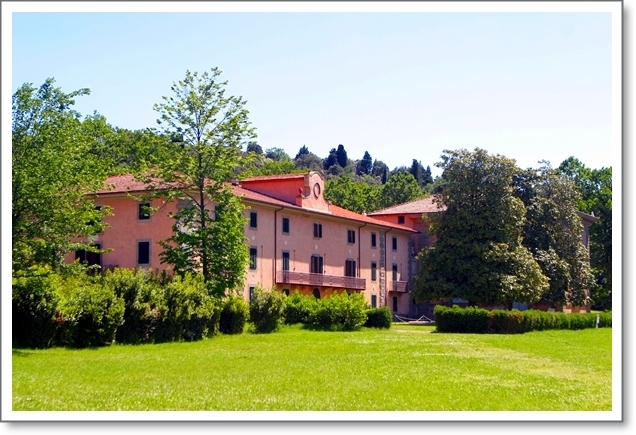 In 1981 the Natural History Museum of the University of Pisa was moved into one wing of the Charterhouse. The collections, started in the mid-16th Century, primarily include paleontological and mineral specimens collected over the centuries. The major construction work on the buildings occurred after the monks returned from the Island of Gorgona (1425) and during the 17th and 18th Century. 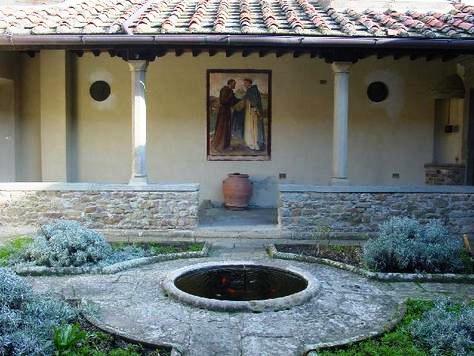 Monk’s cells, the main chapel and other parts of the building, to include a natural pharmacy based upon the research of herbs grown in the Charterhouse’s “Giardino dei Semplici,” were completed in the early part of the 16th Century. The garden, similar in purpose to one established in 1545 by Grand Duck Cosimo di Medici in Florence, was intended to investigate and research plants that might be used for the cure of disease and infection. 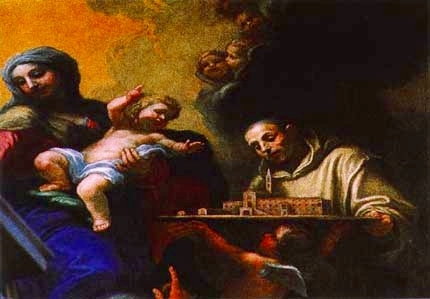 offering the Charterhouse to Our Lady (1681) by Baldassarre Franceschini, called Il Volterrano. An interesting note about the work is that San Bruno holds a model of the Monastery as it appeared before Baroque era changes. This is an incredibly beautiful building, little known by the millions of tourists who flock to a certain tower in the city of Pisa. If you are in Lucca, or Pisa, and seek the opportunity to explore an historic and beautifully preserved site, visit the Charterhouse of Pisa. Here are some on-line resources for your information before a visit. • Closed Mondays and 1/1, 1/5 and 25/12. NOTE: This is a very popular place for school visits, so you may be a bit surprised to see so many children crowded at the entrance to the Charterhouse. Those groups usually only visit the Museum and do not enter the main religious structures for a tour. 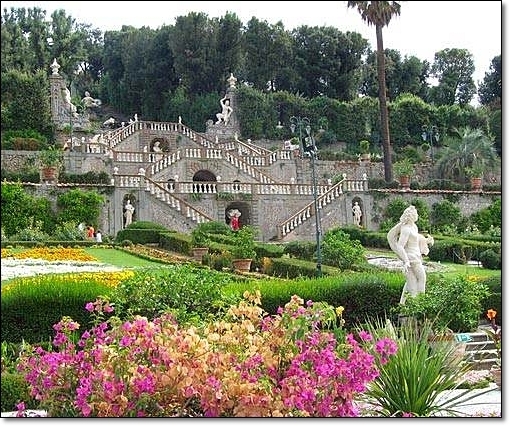 My introduction to the Villa Garzoni and its gardens was during my childhood. Our family lived in Tirrenia, a seaside village about midway between Pisa and the port city of Livorno. Those early impressions have been solidified over many years of subsequent visits to the village and the park named for its most famous son, author Carlo Lorenzini. There will be more on his impact on this tiny town later in this post. 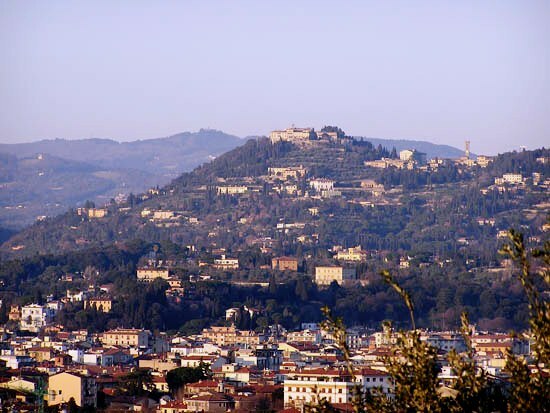 Between Florence and Lucca, along the foothills of the Apennine mountains, is the city of Pescia. A bit north and west of that city, strung along a small ridge, is the village. The village’s main walkway is far too steep for cars or even the infamous “Vapi”, that noisy impossibly small three wheeled transport used by so many Italians. 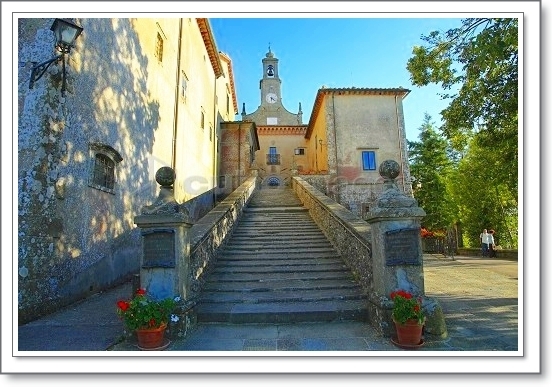 To walk along the cobbled steps and street through town is to encounter an increasingly rare Tuscany. It is a place, above the roads that approach the old city gate, that harkens to black and white photos, to grieving widows dressed in black, to less complicated eras. In 1652, the Garzoni family began construction on a country villa. The site for this home was along a steep hillside near a 10th Century fortress. From the villa’s location, the family enjoyed a view over the valley below. The gardens were designed to complement the villa, while taking into consideration the very steep land upon which it would be built. The results of the design , completed in 1752, were gorgeous. In 1786, members of the family selected a local landscape architect, Ottavio Diodati, to design a water cascade that would run from the highest point of the garden to a grotto constructed at the point where the steep hills met the parterre. the centuries have proven the worth of both the Grazoni family’s and Diodati’s efforts. Three flights of balustrade stairs lead to a Grotto. At each terrace, as visitors ascend the garden, there are long flat planting areas, almost like ribs, that splay out and away from the central axis of the garden. Yews, Eucalypti, palms and other local plants and trees provide welcome shade from the piercing Tuscan light. At the top of the garden, and it is a steep climb, visitors arrive at a statue of Fame, Jove’s messenger. From the large sea shell that Fame holds to her mouth is a long arch of water that ends in a small pond at her feet. On the descent from this high point, visitors can walk to the Villa for a tour, descend through the lush Bamboo forest and return to the entrance gate of the property. 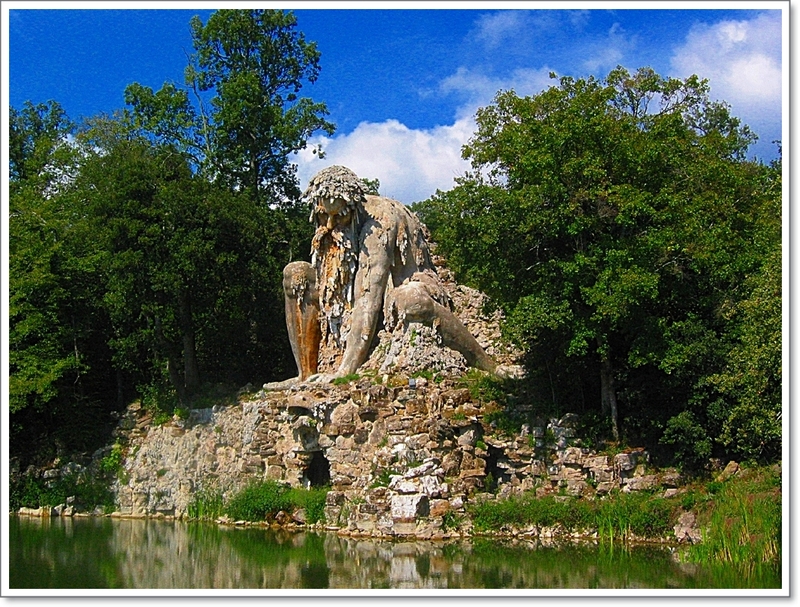 Less than a five minute walk from the entrance to the Villa Garzoni and gardens is the entrance to the Pinocchio Park. The park was named after a character created by author Carlo Collodi. Born Carlo Lorenzini in Florence (1826), he became a well-known political author. In the course of his journalistic career, he began to write political allegory. After many years of work, he took his mother’s home town as his pen name (Collodi) and wrote Pinocchio. The now famous marionette was used by Lorenzini as an allegorical figure who represented the liberating metamorphosis from strict forms of his creation, wood, to the freedom of being a truly human boy. Lorenzini died in Florence in 1890, a mere seven years after Pinocchio was published. He did not live long enough to enjoy the spectacular success that his book created. Now translated in over 100 languages, it is one of the world’s best-selling books of all time. You can read the entire book, on line, or download an e-book copy at this site. Special thanks to the Guttenberg project and the phenomenal work they do. 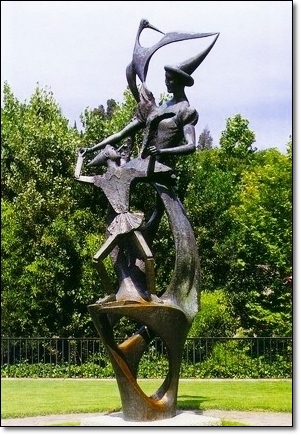 The “Parco Pinocchio” was opened in 1956, the result of country-wide artistic collaboration. Artists from across Italy participated in the creation of sculptures and mosaics that appeal to child and adult alike. Scenes from Carlo’s fable are represented within the small confines of the park. 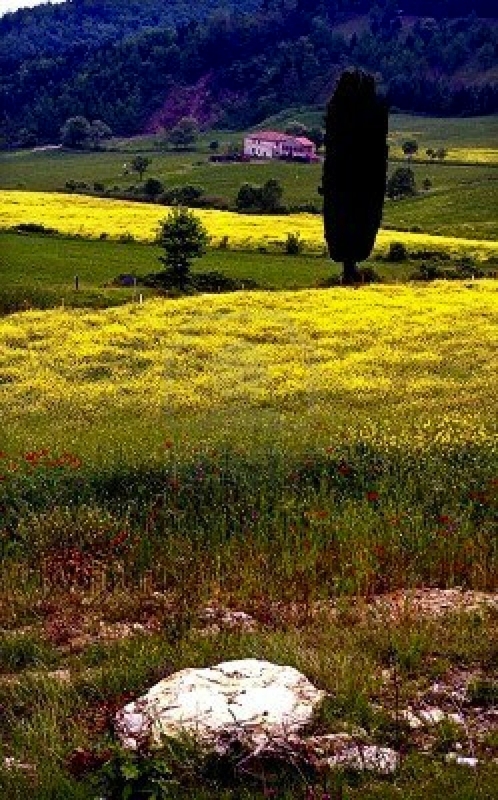 A visit gives you the unique opportunity to enjoy yet another treasured corner of Tuscany. It has been decades since my first visit to this tiny, magical, place. Every time I am in Tuscany, I return. Take time to enjoy this extraordinary and little-known village perched on a hill between Florence and Lucca. If you do not have the use of a car, you can take an inexpensive regional train from Florence’s Santa Maria Novella station and, for Euro 10.40 per person, arrive in Pescia.Trains between Florence and Pisa leave nearly every hour between 6:00AM and 10:ooPM. The trip to Pescia takes about one hour.